I can’t resist a good old original chocolate chip cookie. I started baking when I was a kid. My sister and I spent many weekends broadcasting “Kids Cookery” from our kitchen, inspired by the latest section of “Hey Kids Let’s Cook” in the St. Louis Post Dispatch. Pretty impressive for kids who didn’t have cable and never watched TV! Turns out, I never really outgrew my adventures in baking or my experiments in the kitchen. 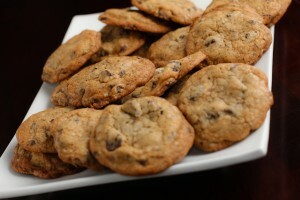 This original chocolate chip cookie recipe was definitely worth all the botched batches to get it just right! I proudly won a blue ribbon at the Washington Town & Country Fair with these chocolate chip cookies back in 1995, and I continue to spread the cookie love whenever I get a chance! The secret to these cookies is a greater ratio of brown to white sugar, extra vanilla, extra chocolate chips, dark chocolate, room temperature butter, and a specific mixing technique. Confession of a *wannabe* baker… Every once in a while there may be a “Kids Cookery” encore that broadcasts from the Cavedine Kitchen. Add the room temperature butter to a large bowl and beat until light and creamy. Add the brown and white sugar to the butter mixture and beat until light and fluffy. Add the eggs and vanilla and continue to beat until the mixture is airy and light. Continue beating and mix in the salt and baking soda. Reduce the mixer speed to low and gently add the flour. Mix on low speed until just combined; do not over mix! Gently stir in 3 cups of chocolate chips or chopped chocolate. Scoop the cookie dough onto cookie sheets using a mini ice cream scoop. We really did have star potential….